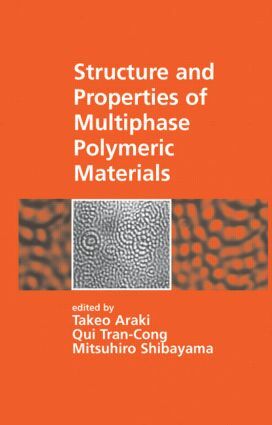 Offers an overview of recent advances in multiphase polymeric materials, ranging from theoretical aspects of polymer miscibility and phase separation kinetics to bulk, surface and interface properties in polymeric materials. This work considers the possibility of a nondestructive methodology to investigative multiphase polymers based mainly on a scattering technique that is sensitive to changes in the phase behaviour of multicomponent polymer systems. Part 1 Theory: phase segregation in copolymer and homopolymer and multi-component mixtures; dynamics of phase-separation and its application to polymer mixtures. Part 2 Structures: miscibility and critical phenomena in binary polymer blends; block- and graft copolymers; phase separation and morphology of chemically reacting polymer blends; multiphases in polymeric gels; shear dependence of the equilibrium and kinetic behaviour of multicomponent systems. Part 3 Properties: surface organization and dynamics in multicomponent polymer systems; rheology of multiphase polymeric systems; polymers at interfaces; thermal conductivity of multiphase polymers; plastic deformation mechanisms of polymers and rubber-modified thermoplastic polymers; future directions of researches in multiphase polymeric materials.